I had a boss many years ago who could get distracted by anything new and shiny. Any new technology, opportunity, or cool project to take on, he wanted to try it. For him, it may have seemed like fun. But for his direct reports, it was overwhelming. It seemed like we never had a clear purpose and, because of that, it seemed like we never had a clear set of goals. I’m guessing that’s what a lot of marketing teams feel like right about now, amidst an explosion of new MarTech tools that promise to do anything and everything—regardless of whether your company really needs them. First off: let’s define “marketing stack.” If you aren’t into buzzwords, a marketing stack is just a collection of programs from different vendors that marketing teams use to attract and retain customers. And in today’s omnichannel marketing universe, most companies have a big one. Indeed, by 2017 the MarTech landscape had reached 5,000 vendors—40 percent more than the year before. What’s more, it’s believed tech spend by CMOs will increase 10 times in the next 10 years (from $12 billion to $120 million.) Clearly, those vendors are good at marketing their products. But does your marketing team really need them? A recent poll of CMOs revealed that only 3 percent of them felt their automation, engagement, and deployment efforts were connected. At the risk of being brutally honest, there is no way your marketing stack can be working effectively if it isn’t streamlined and aligned. (My colleague Shelly Kramer recently wrote a great piece about this: Enterprise Giants Continue Their Focus on MarTech.) So, the question remains, how do you organize your marketing stack and make sure it’s working for you? First and foremost, I believe you need to start with your company’s strategic business goals. It makes no sense to evaluate your stack of tools if you don’t even know what you’re trying to accomplish. This is not just a marketing discussion. This is an enterprise-wide commitment to what your marketing efforts are trying to do or gain—what data you’re trying to gather—and how it all comes together for the good of the company. Without that, your stack may be big and shiny—but it could also be useless. From there, many companies find it effective to visualize their stack, taking stock of all the vendors they’re using, and for what purpose. In this map by Datapipe, for instance, the company has organized their vendors into the role they play in their marketing efforts. I love their approach because the focus is on the overarching goal of the technology, rather than the technology itself. 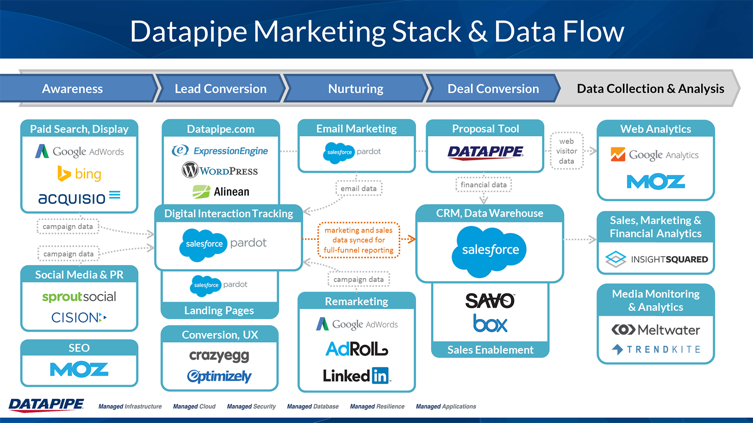 From there, you can start playing MarTech Jenga. By that, I mean taking a look at the spots on the map where there is overlap or inefficiency. Begin to analyze and discuss which pieces of the stack could be eliminated with little to no impact to your overall goals. Do they all serve an important purpose that aligns with your main business goal? If not, consider dropping them from the stack. Cohesiveness and simplicity are always better than clutter and fragmentation. Have the courage to say “no” to tools that no longer suit you. And, have the courage to consider newer, different tools that might serve you better. Marketing teams today are so focused on gathering data that they can forget to apply analytics to the effectiveness of their own campaigns. Use data at every step of the stack-making process, from adopting a program to making changes. If your stack isn’t generating results, you need to find out why. If you have not yet developed metrics to determine the effectiveness of your stack, it’s time to make them. There is so much data out there nowadays for marketing teams to manage that it’s critical for you to bring machine and deep learning into the fold. In fact, if your stack is missing these tools, you need to regroup immediately. Deep learning can help you find patterns in real time. That means you can personalize a campaign—change a campaign—or adapt to a newly surfacing trend immediately as it’s happening, rather than waiting for the metrics to come in. Developing an effective marketing stack is not a one-and-done thing. It needs to be evaluated constantly to ensure you’re meeting the ever-changing demands of the market. Work to define “success” for your teams and tools to ensure you continue to work effectively going forward. Every marketing team’s stack will be different, depending on their needs, budget, internal capabilities, etc. But all should meet the stack’s definition: a group of tools used to attract and retain customers. After all, there’s a lot of cool MarTech out there. But if it doesn’t somehow lead to a better, more satisfied experience for the customers you serve, it really isn’t serving you at all.